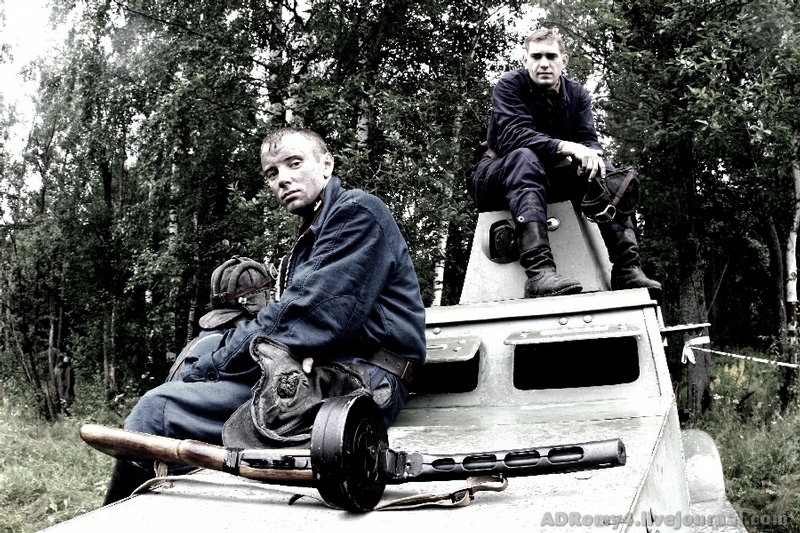 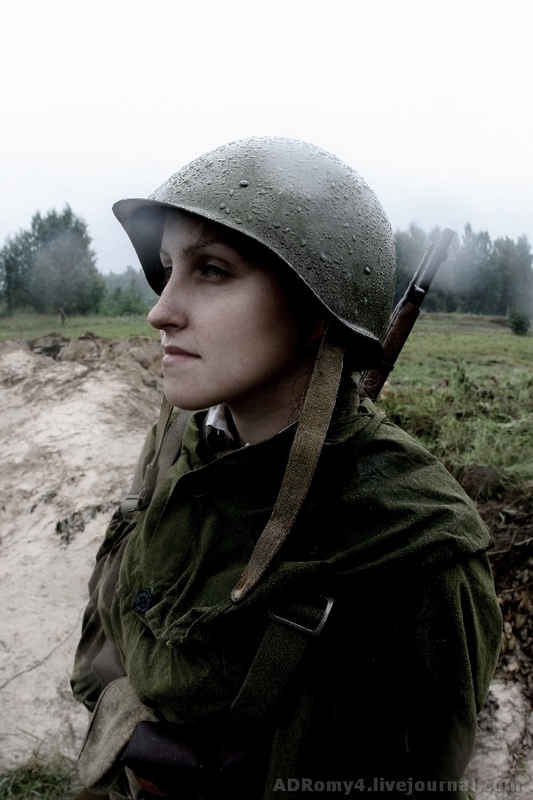 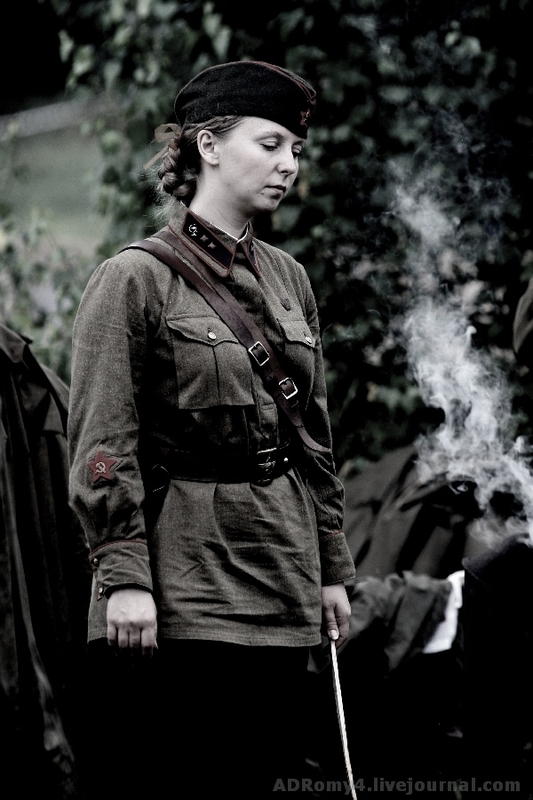 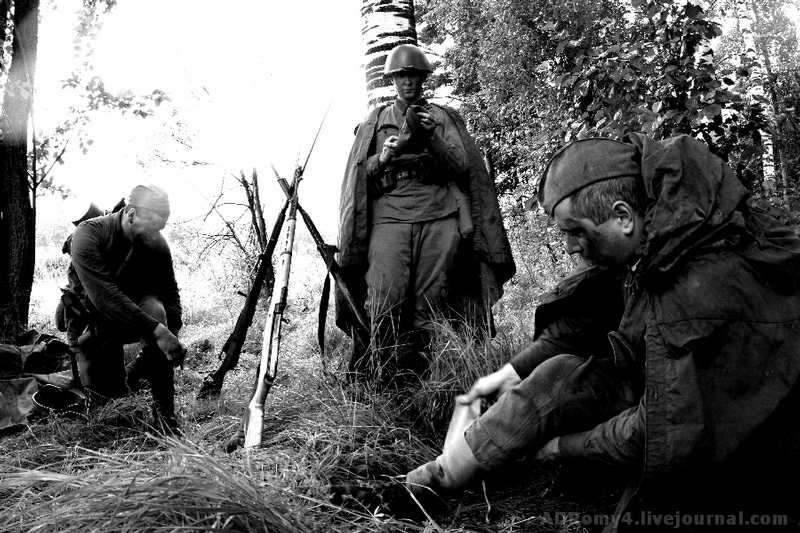 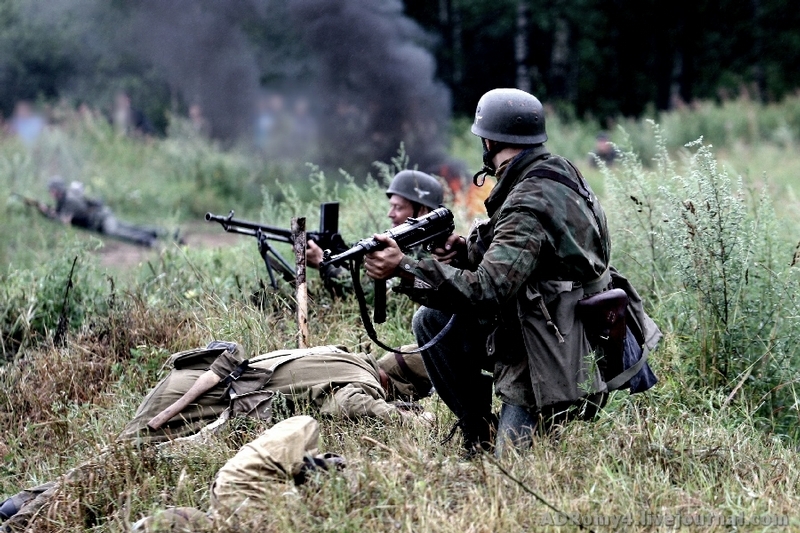 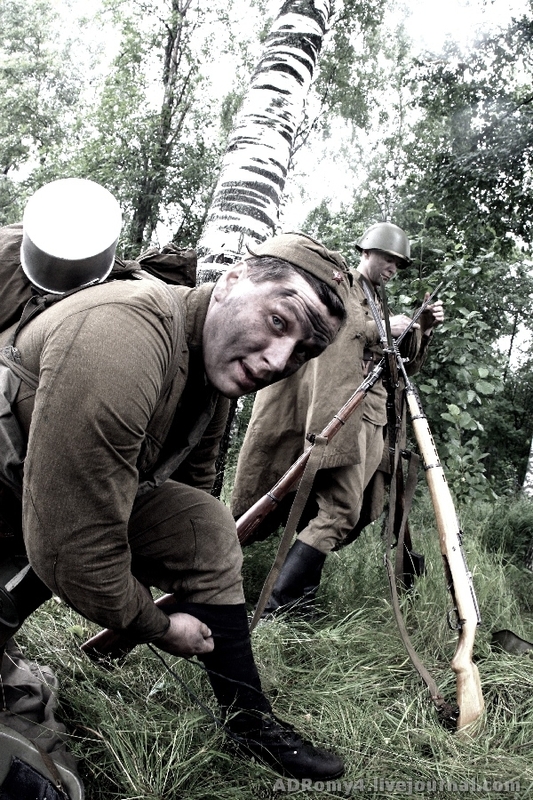 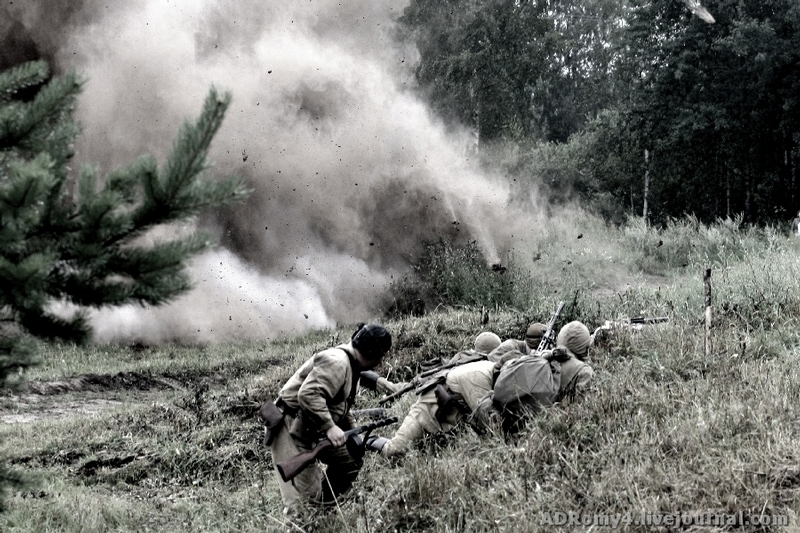 Lately, the reconstruction of the battle of the 30th of July, 1942 has been held in the Russian city of Kirovsk. 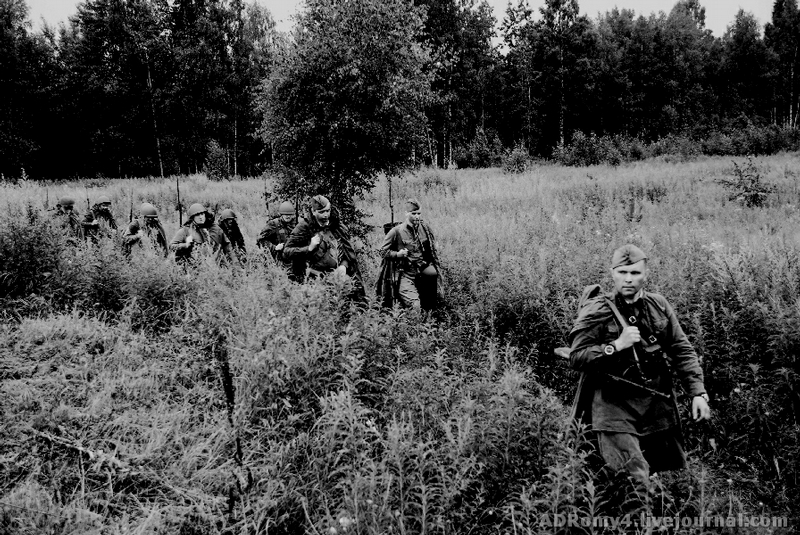 On that terrible day the soldiers of the Workers’ and Peasants’ Red Army (RKKA) fought against the Wehrmacht under the support of the Luftwaffe and jaeger! 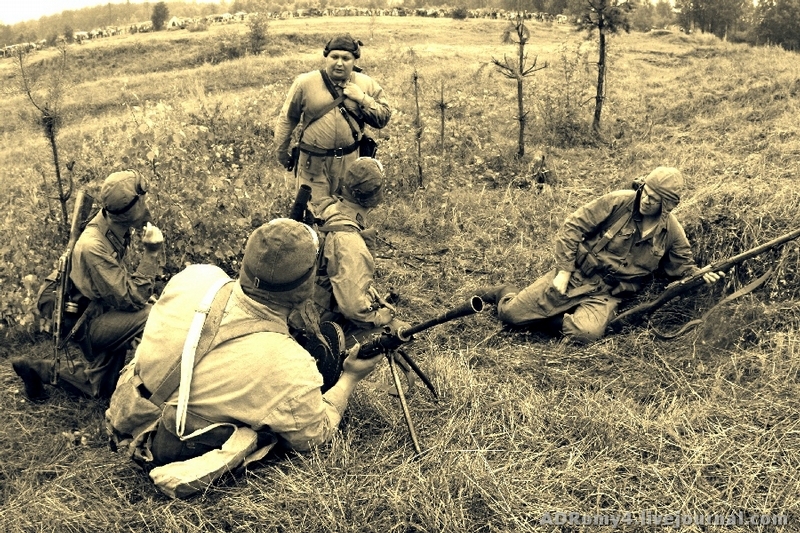 During this reconstruction a lot of people were “killed”, several pieces of equipment (including the heavy one) were destroyed… In the end of the battle the soldiers of the RKKA were forced to storm their own positions!!! 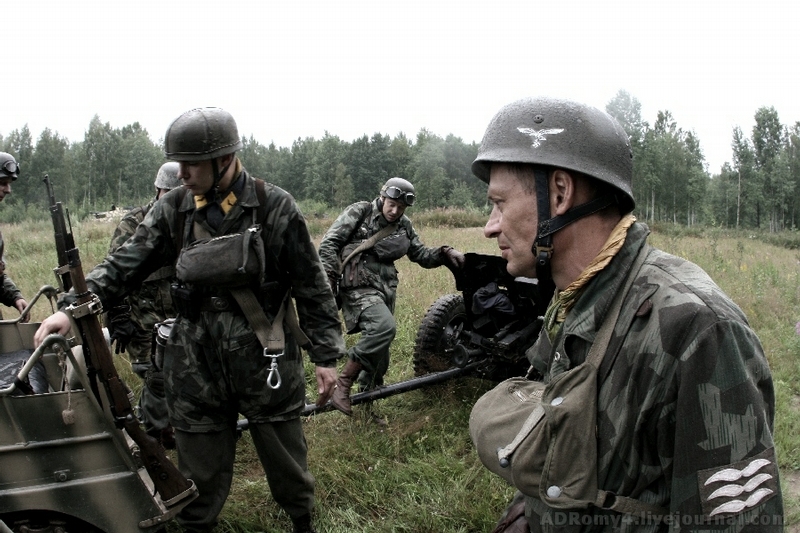 Many photos of this event are inside the post. 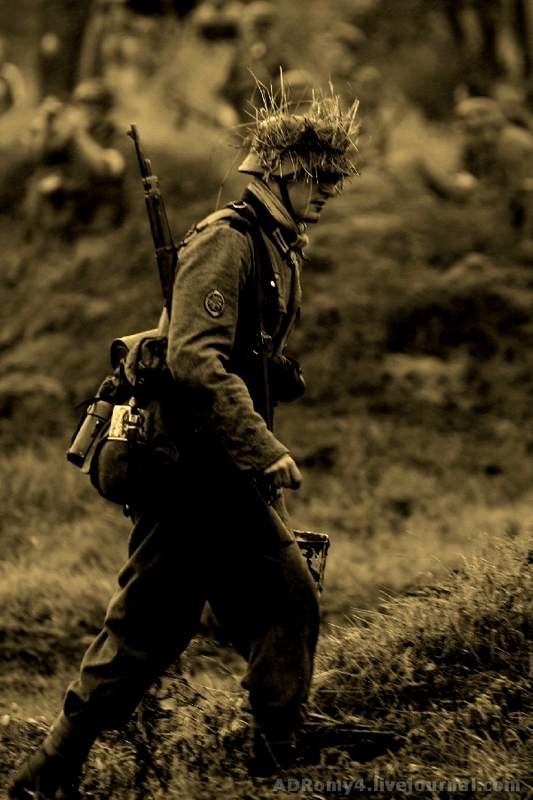 Everything is quiet in the German camp. 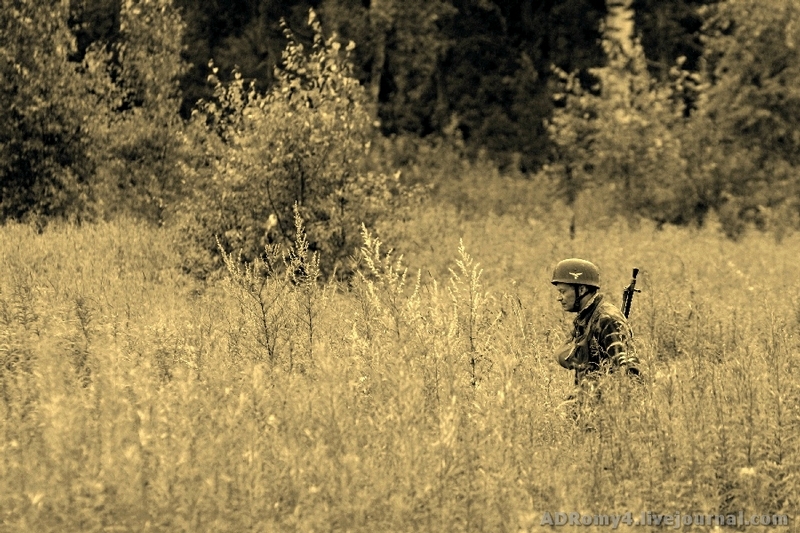 Jaeger sit at the table and smoke. 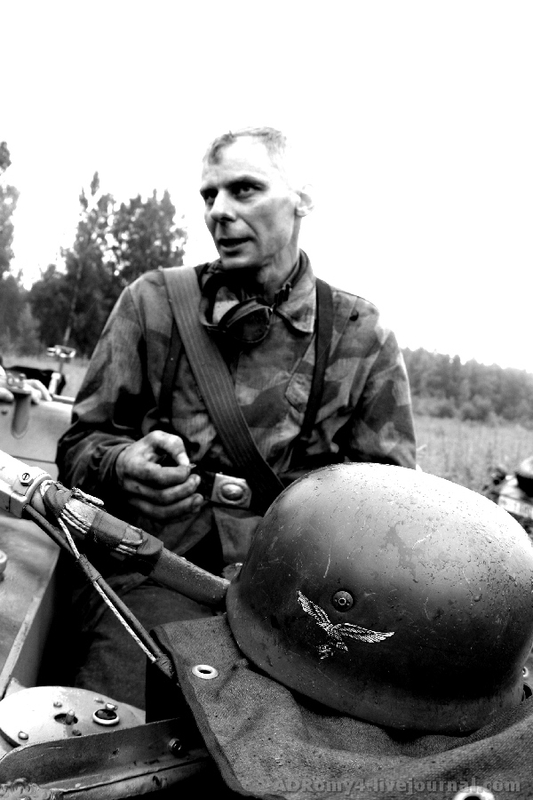 A paratrooper has just successfully jumped out of the Henkel, Junkers-52 or some other means of transport. 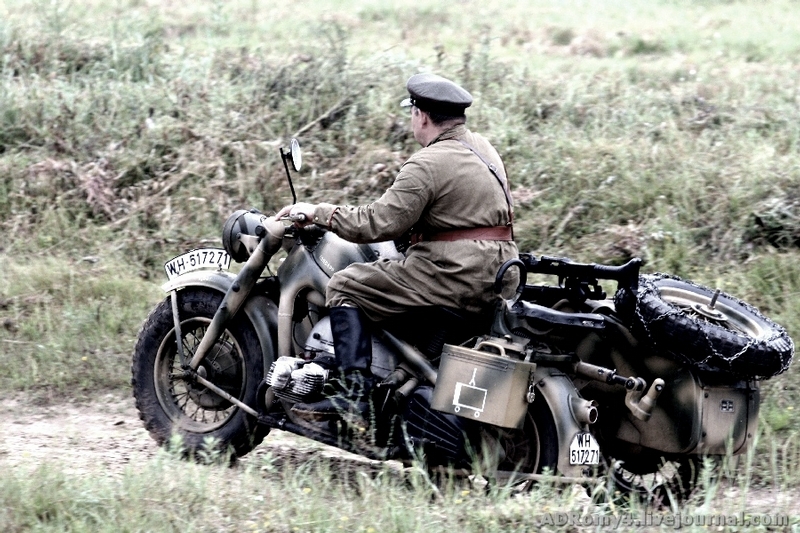 Bikers are on their way to the front line to report about the beginning of the next phase of Operation Barbarossa! 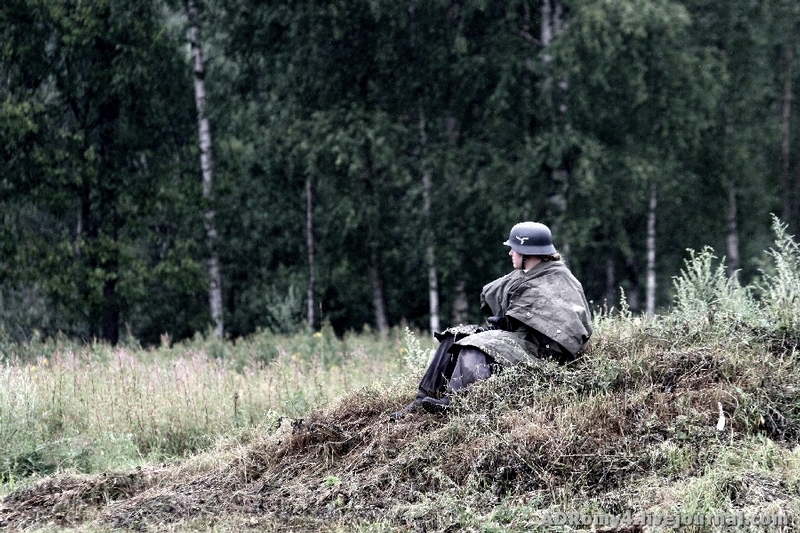 German Luftwaffe-Frau sits on the grass in faraway Russia. 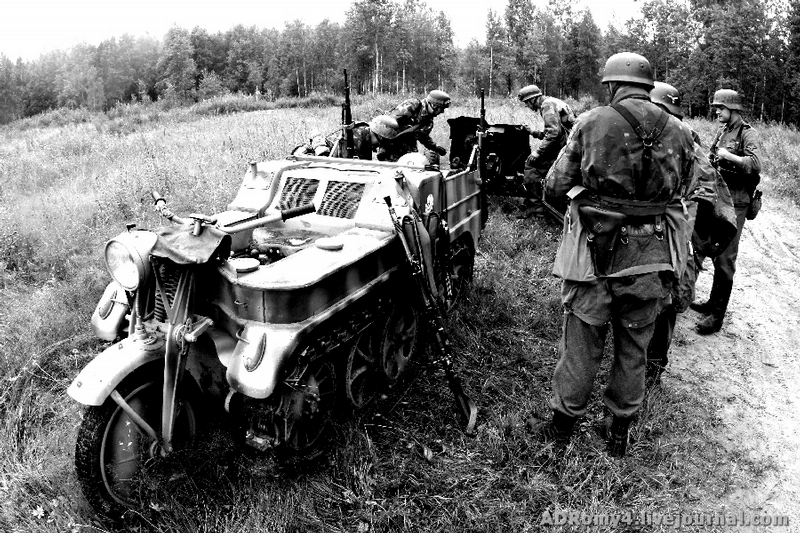 Brand-new German tanks, the Pz-III and Pz-IV, delivered by railroad, are ready to start the fight. 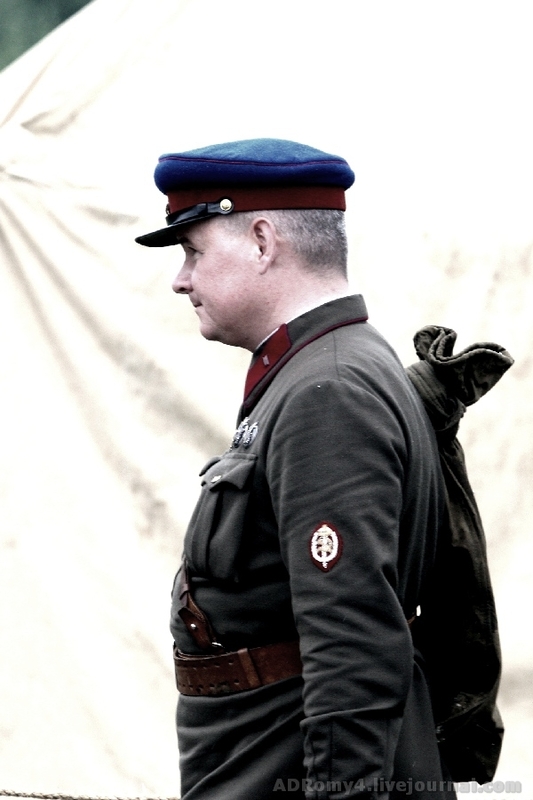 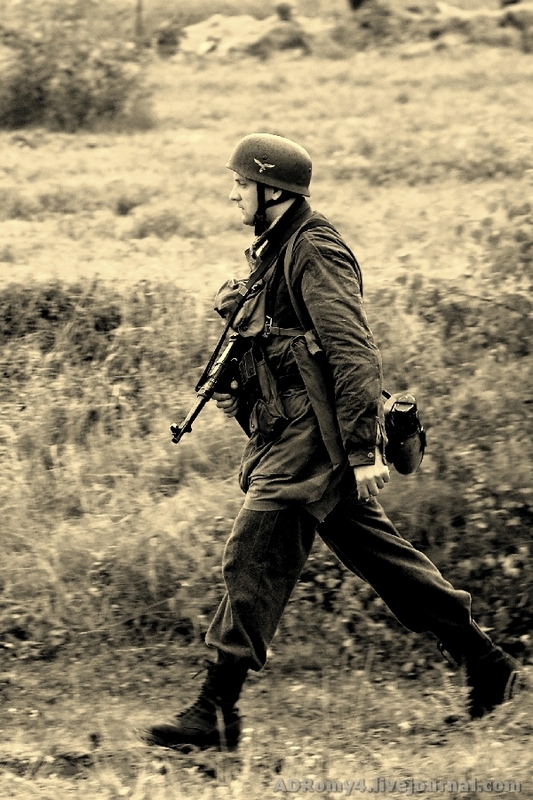 An experienced paratrooper approaches his position… On his shoulder you can see the Czech gun. 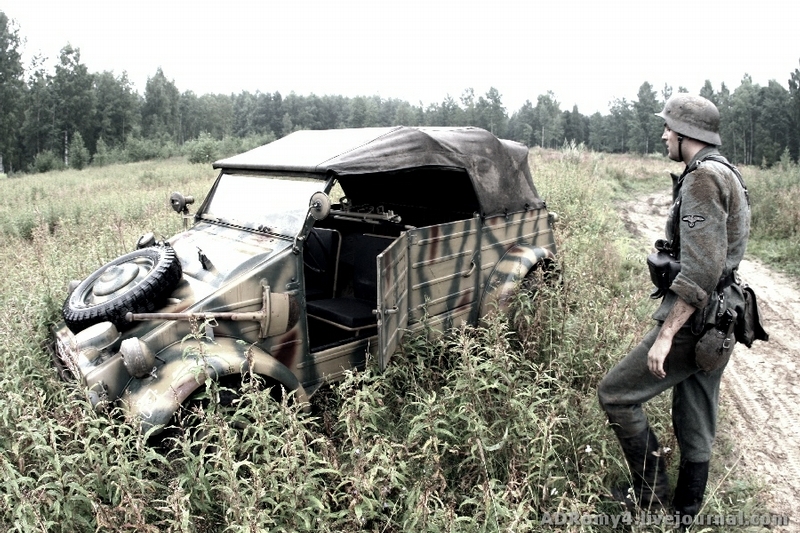 The cannon RAK 37 is attached to the Kettenkrad. 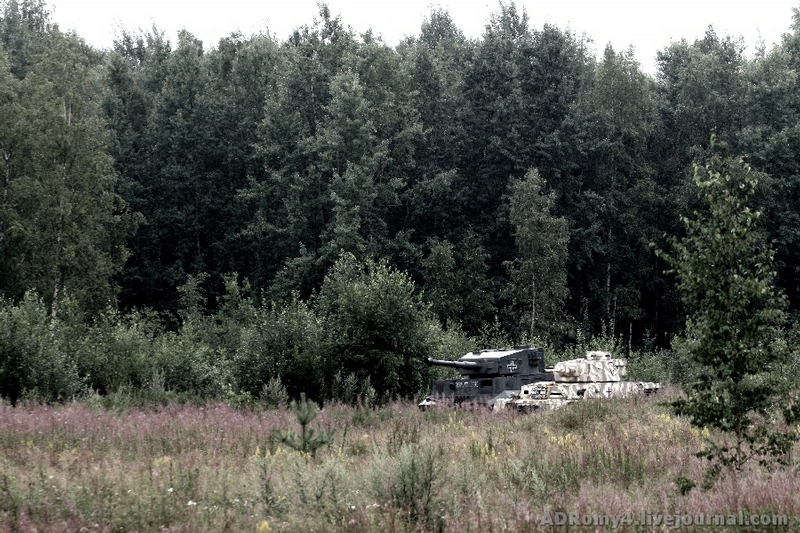 According to some data, there are only 3 such cannons in modern Russia and only one of them (pictured) takes part in reconstructions. 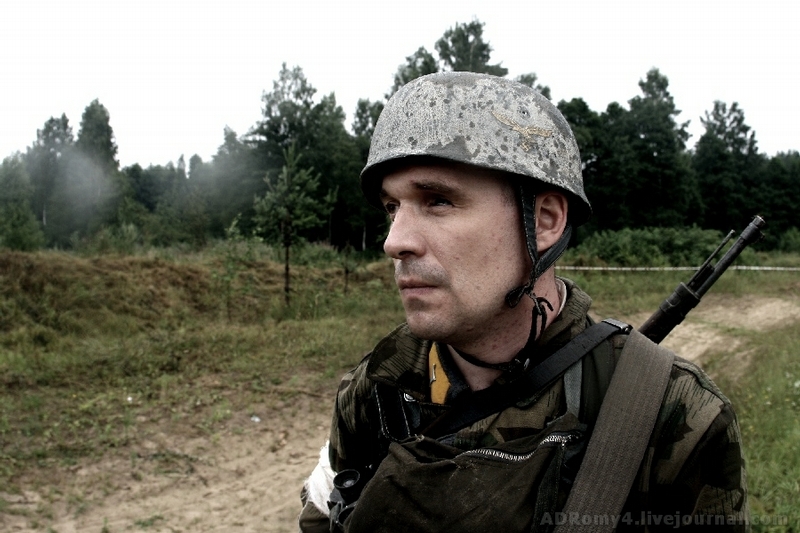 A soldier with two medical pouches serves as an orderly. 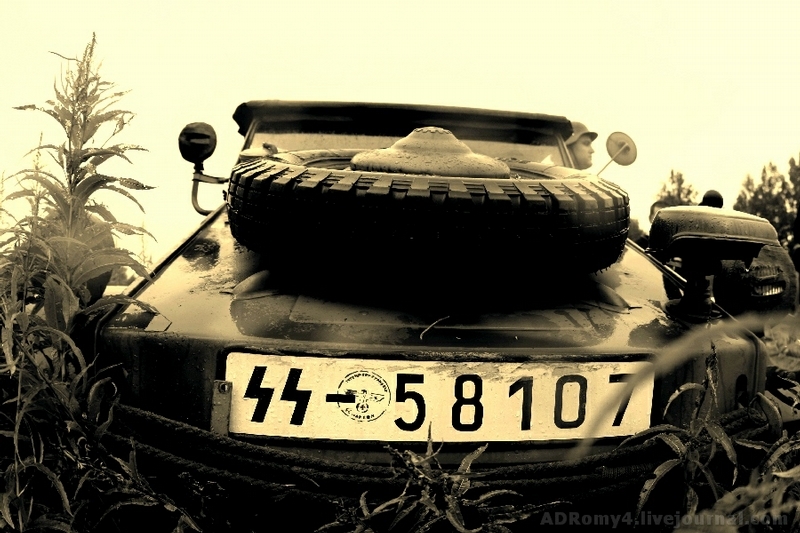 The Wolkswagen belonging to the SS troops. 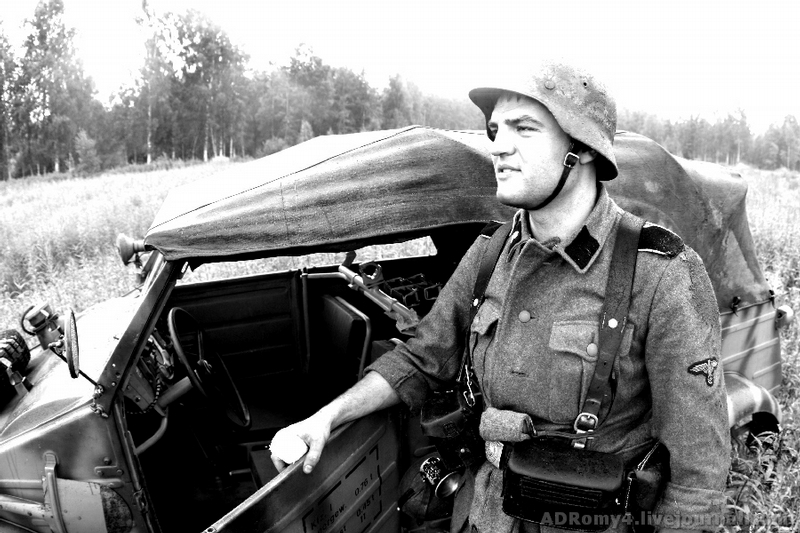 The driver of the Kettenkrad. 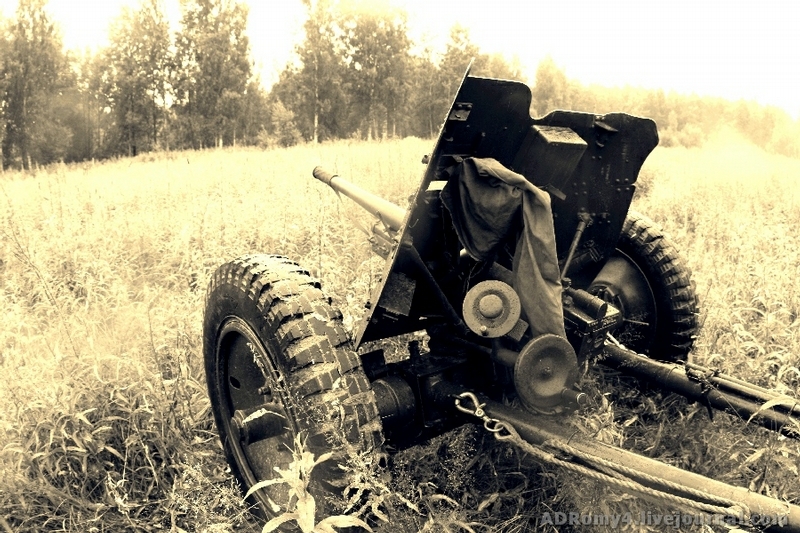 The cannon is ready to fight! 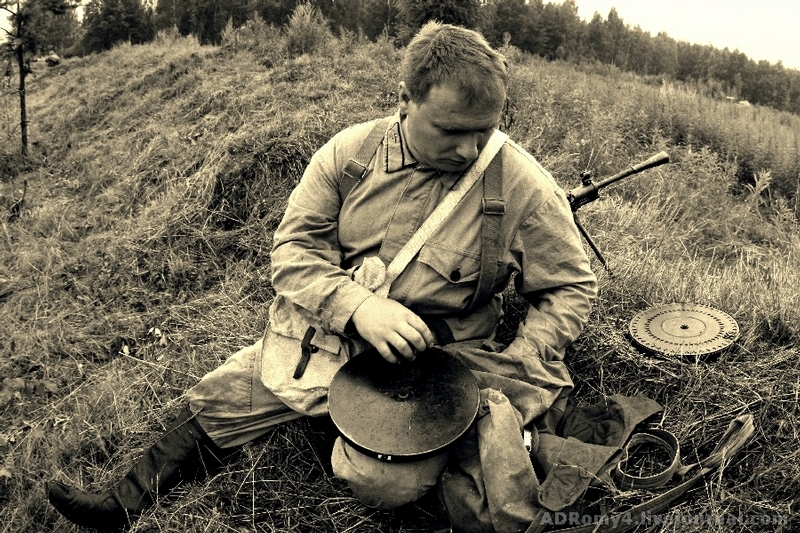 Meanwhile, the political officer in the camp of the RKKA is going to send his soldiers to certain death! 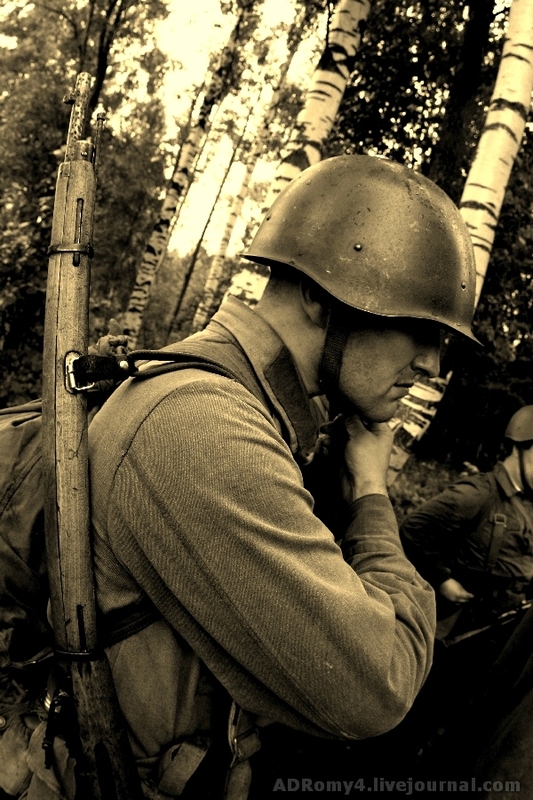 His “comrade” is already in a gloomy mood. 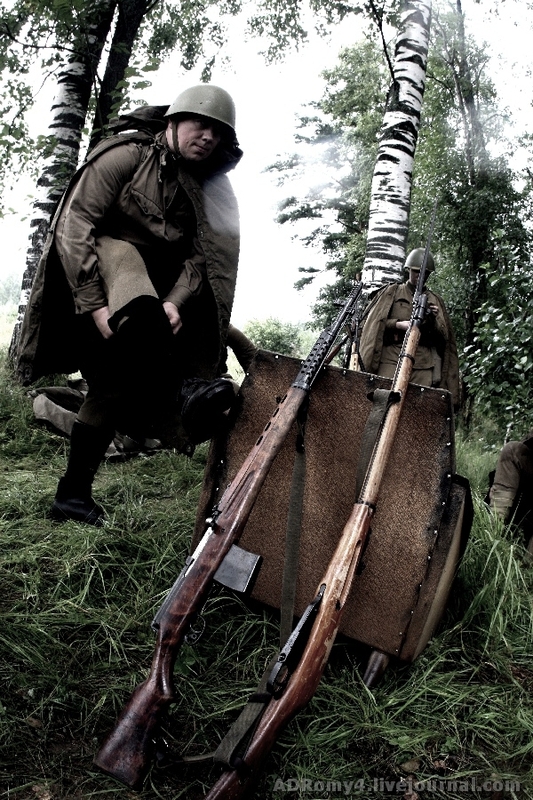 Guns wait for their time. 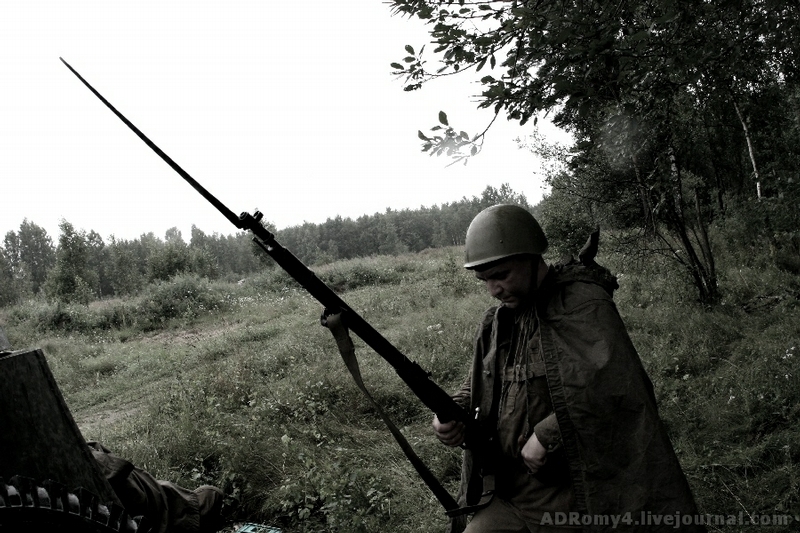 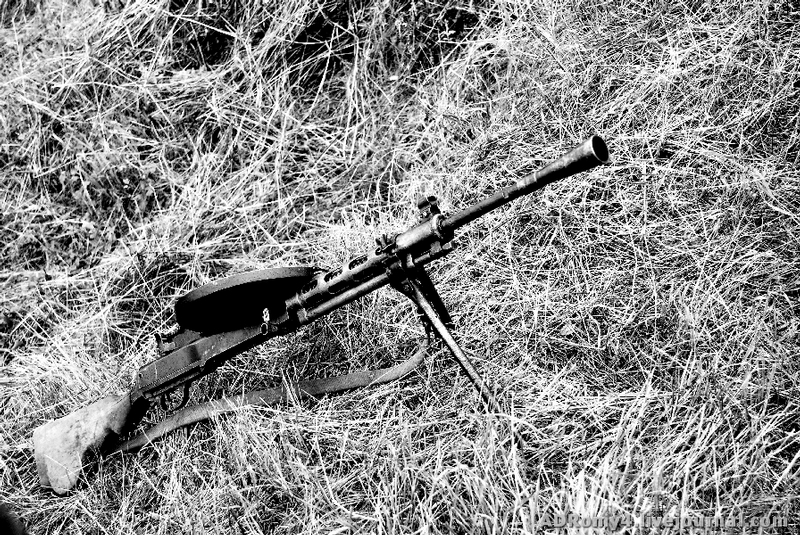 A soldier loads his Degtyaryov’s machine gun. 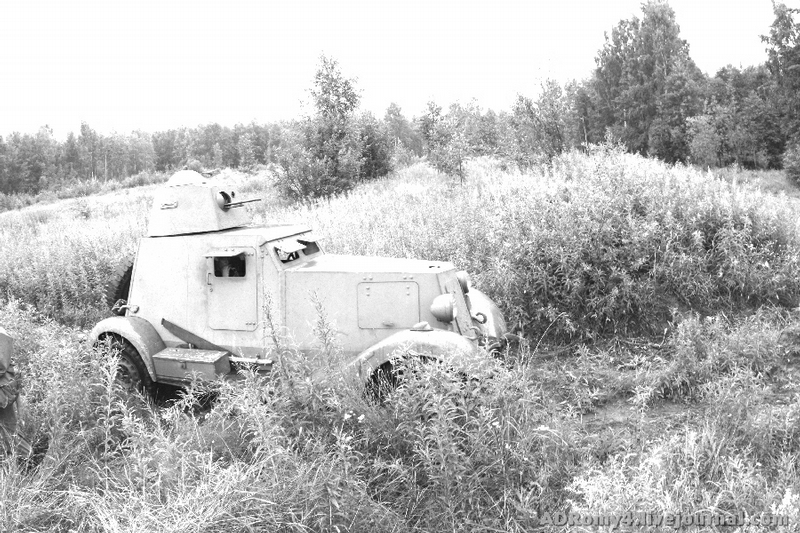 The armored car of the RKKA takes its position in a forest. 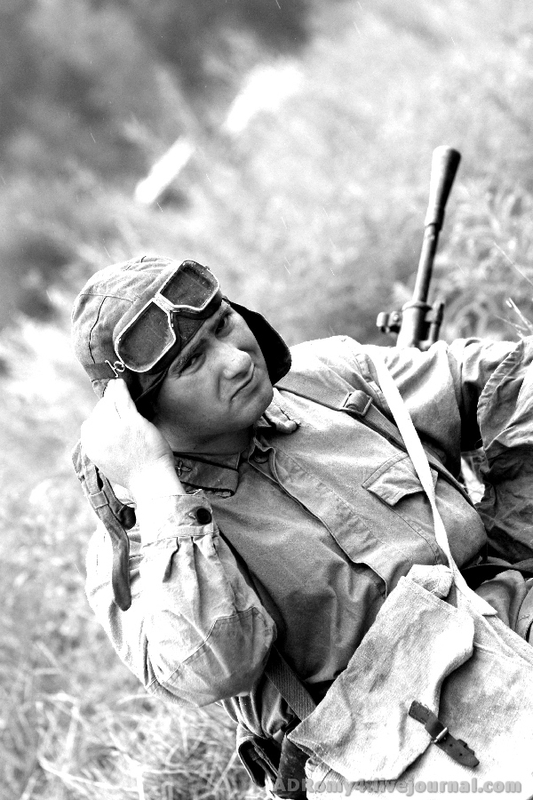 A pilot, though he’s already used to fight on the ground. 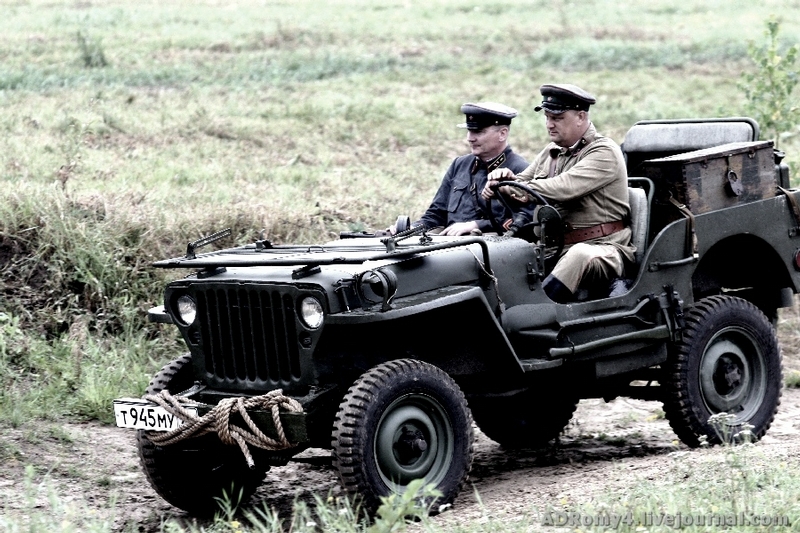 The command of the Red Army rides around the positions in a fashionable “Willys” delivered from America! 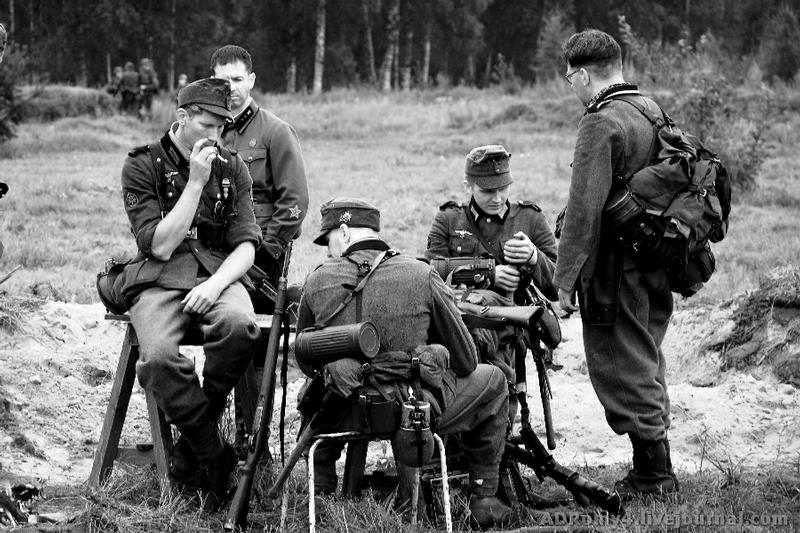 Tankmen have a rest before the difficult battle. 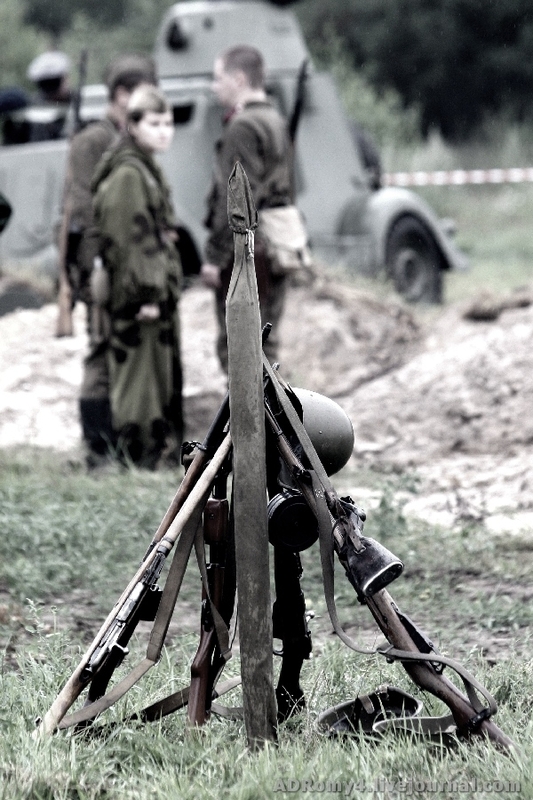 Someone is ready to bayonet. 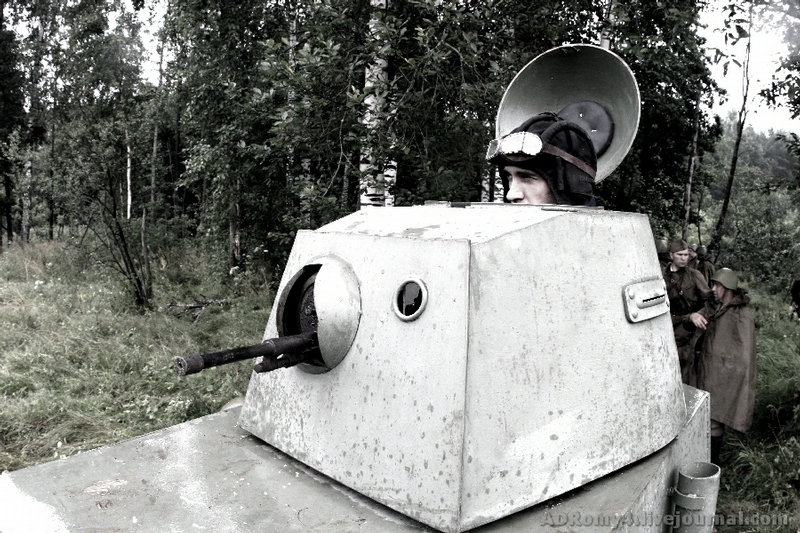 The DP in a turret. 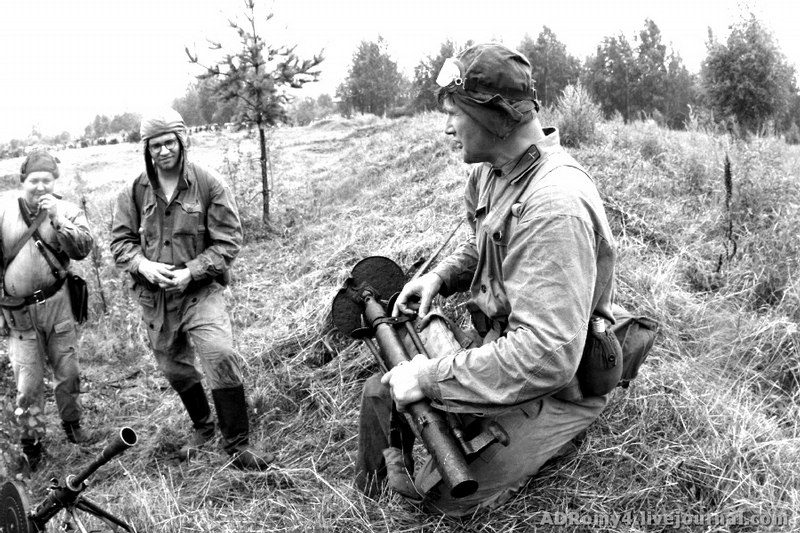 A soldier with a 50-mm mortar. 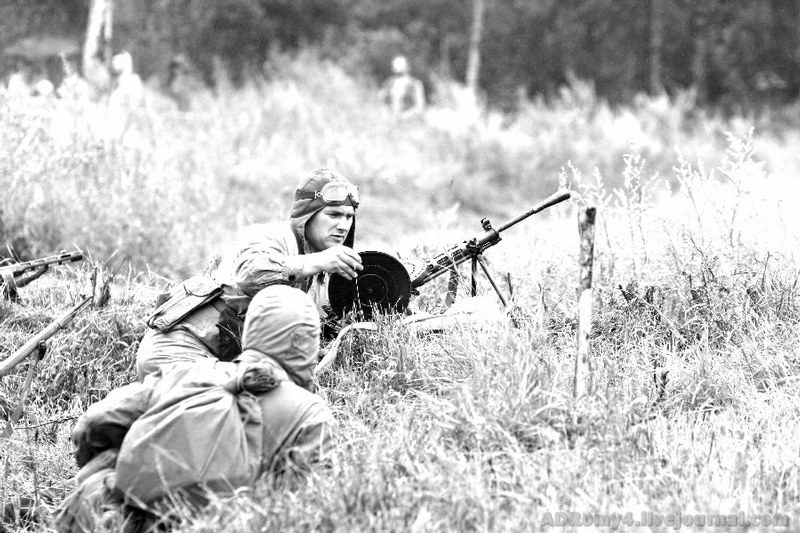 The “Maxim” gun is pointed at the direction of the enemy. 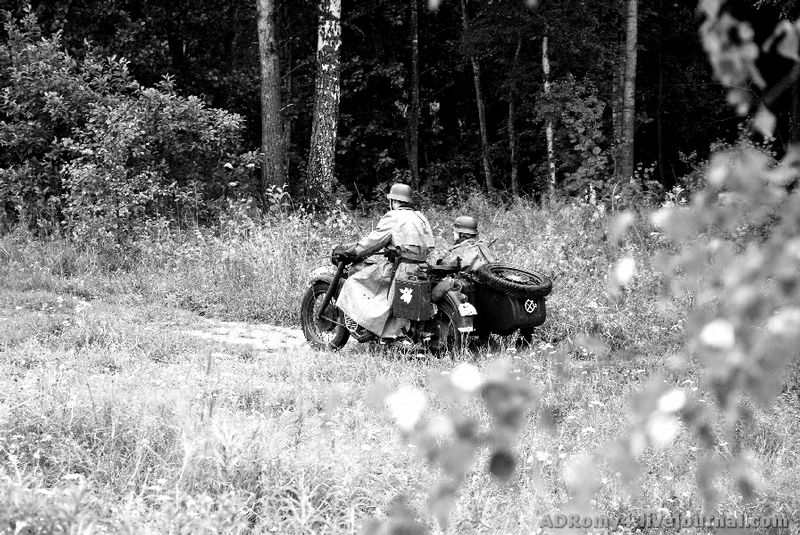 A scout hurries up riding a captured German motorcycle (BMW or ZUNDAP) to report that German soldiers were seen on the forest border. 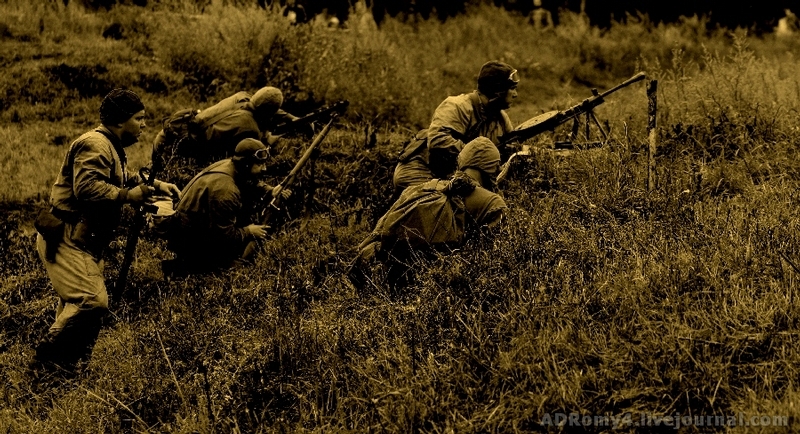 A machine gunner and soldiers immediately take up their positions. 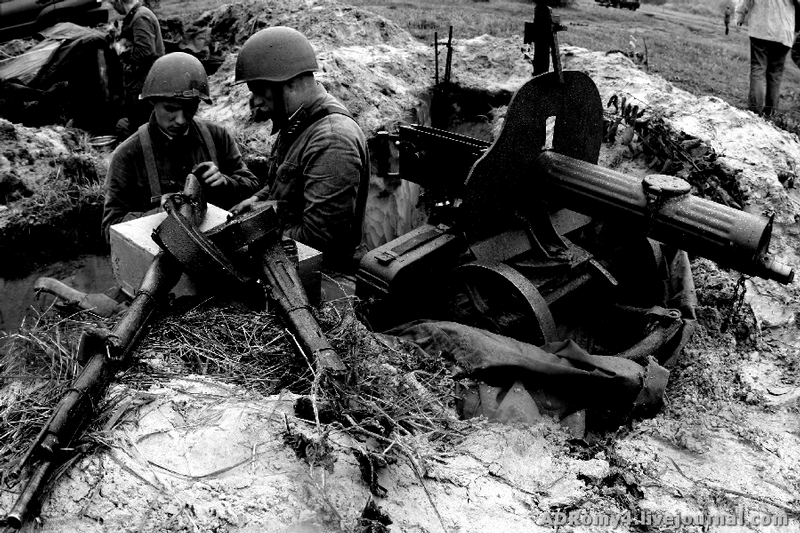 At this moment artillery preparation begins. 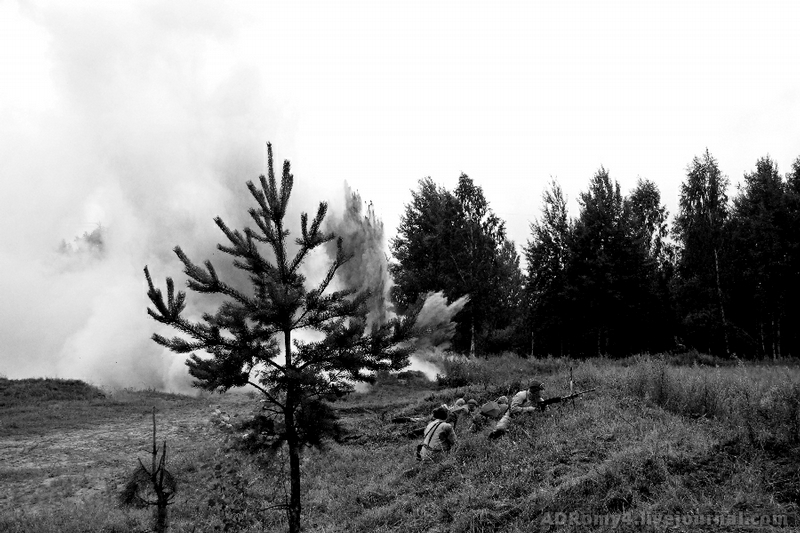 German artillery starts firing at the positions of the RKKA.